Removal ProcedureRemove the camshaft cover. Refer toCamshaft Cover Replacement - Right Side.Remove the camshaft position actuator solenoid valve solenoid – intake. Refer toCamshaft Position Actuator Solenoid Valve Solenoid Replacement - Bank 1 (Right Side)Intake.Remove the intake camshaft position sensor. Refer toCamshaft Position Sensor Replacement - Bank 1 (Right Side) Intake.Remove the exhaust camshaft position sensor. Refer toCamshaft Position Sensor Replacement - Bank 1 (Right Side) Exhaust.Remove the camshaft position actuator solenoid valve solenoid – exhaust. Refer toCamshaft Position Actuator Solenoid Valve Solenoid Replacement - Bank 1 (Right Side)Exhaust.Rotate engine clockwise using crankshaft dampener retaining bolt until the flats atthe rear ends of the camshafts are pointing up. This puts the camshafts on “base circle”and will reduce their tendency to rotate from valve spring pressure when the camshaftposition actuators/drive chains are removed. Note:Do NOT remove or back out the camshaft position actuator bolt(s) significantly, simplybreak them loose from their fully-torqued position. The position actuators must stayfirmly attached until the retaining tools are in place, but they should be brokenloose while the chain is still tight and in position. Loosen intake and/or exhaust camshaft position actuator retaining bolts, dependingon which camshaft position actuator and/or camshaft you will be servicing. 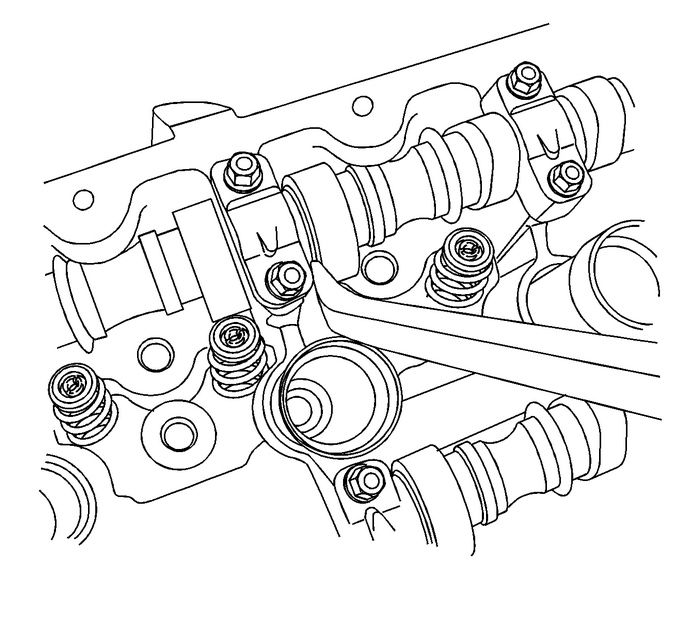 If servicingboth camshaft position actuators and/or camshafts, loosen both bolts. 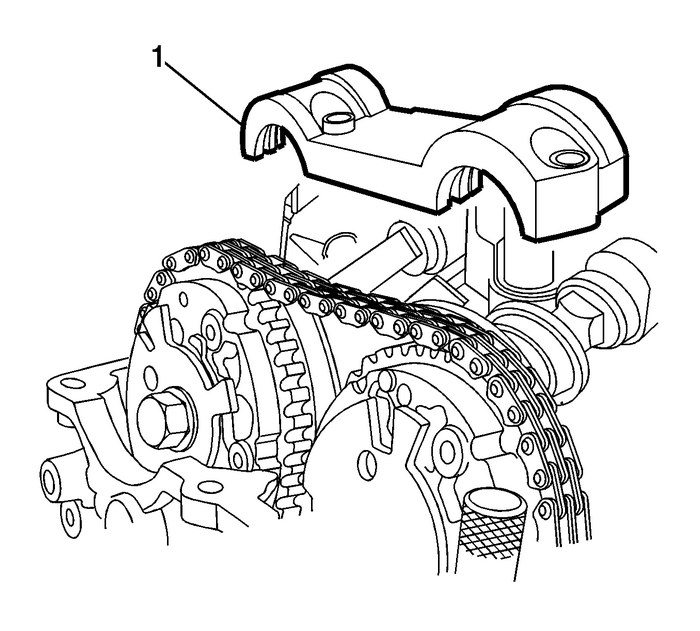 Note:Be certain to clearly mark the position of the chain to the camshaft position actuator(s).Though the engine does not need to be set to a specific timing mark before startingthe procedure, the relationship of the chain to the actuator(s) is critical and mustbe reestablished on assembly. 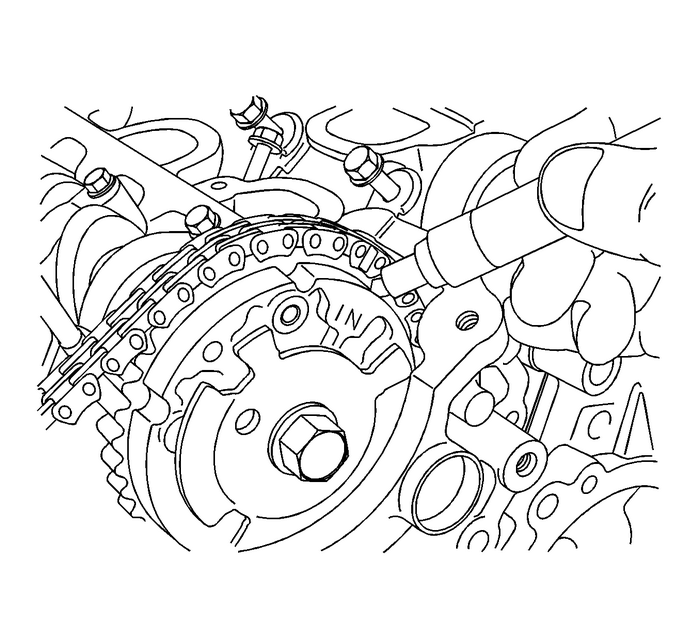 Mark the position of the chain to the camshaft position actuator – intake. 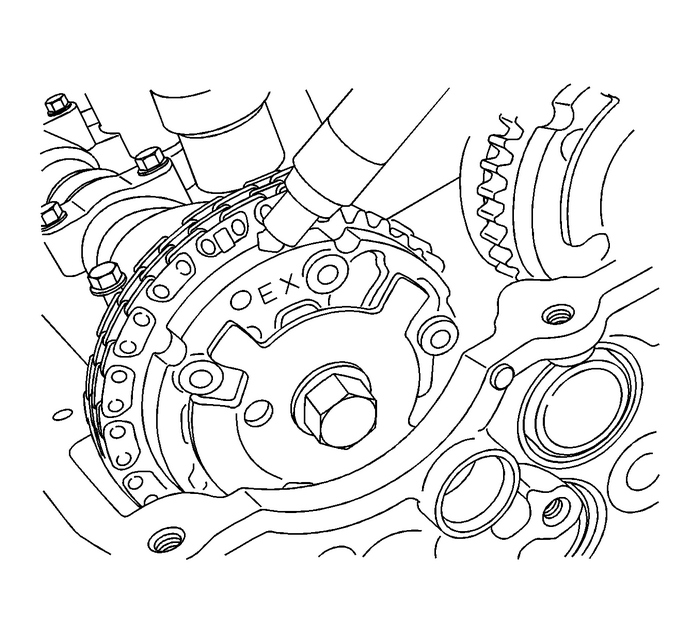 Mark the position of the chain to the camshaft position actuator – exhaust. Remove camshaft front cap bolts-(1). Note:Do NOT remove or loosen any other camshaft bearing caps at this time, even if youintend to eventually remove the camshaft. Remove the camshaft front cap-(1). Loosen wingnut-(4) to open the clamping area of EN49982-1 retainer. Note:Do NOT overtighten the thumbscrew. The EN49982-1 retainer should be able to slide slightly via the slot the screw goes through. 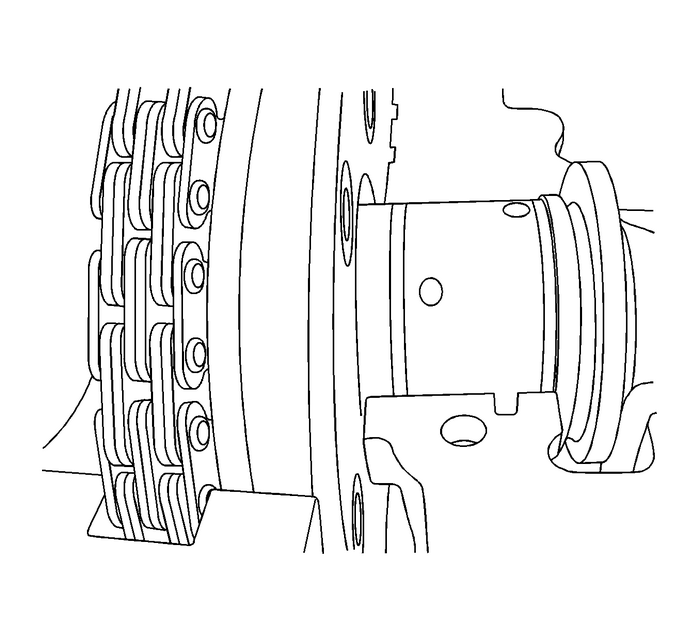 This fore/aftmovement will allow easier removal and installation of the chain later. 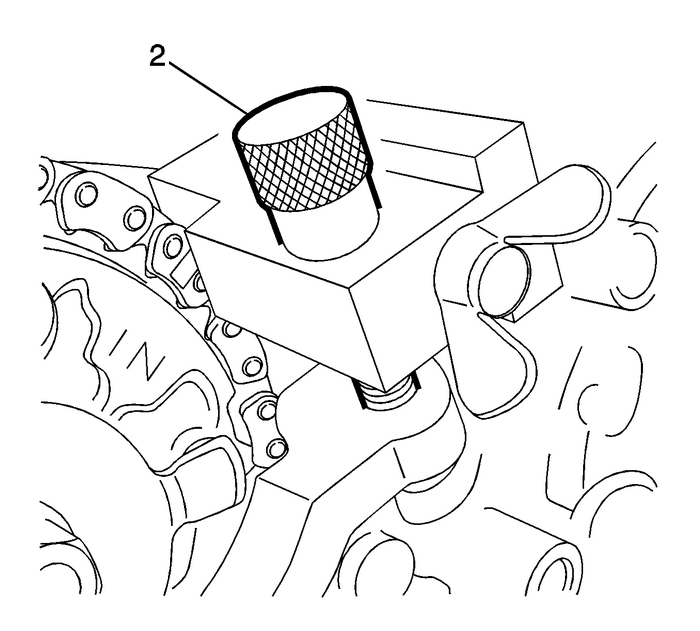 Install EN49982-1 retainer intake side chain holder onto front cover by screwing in the thumbscrew-(2) on theEN49982-1 retainer finger-tight. Note:Do NOT tighten the wingnut with a tool of any kind. Firm finger-tightening is sufficient. 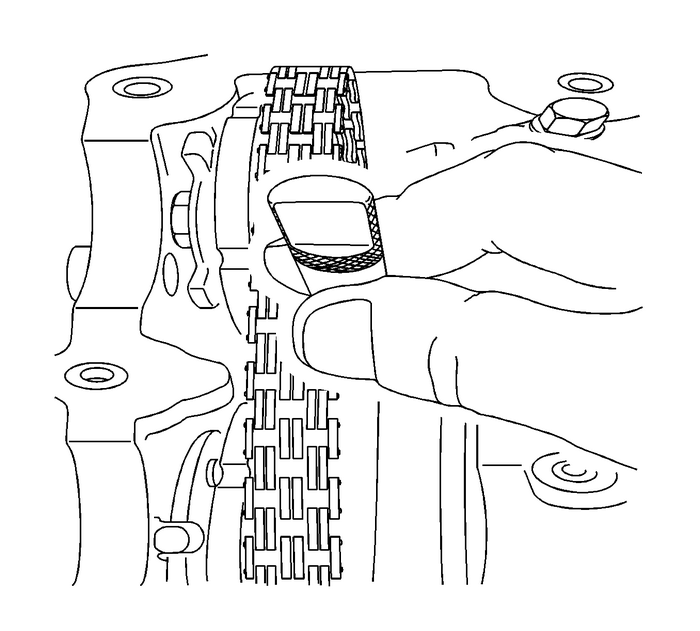 Tighten wingnut (4) so EN49982-1 retainer closes over and firmly grasps timing chain. Note:The engine front cover is removed for clarity in the following graphics, but is NOTrequired to be removed to perform the procedure. 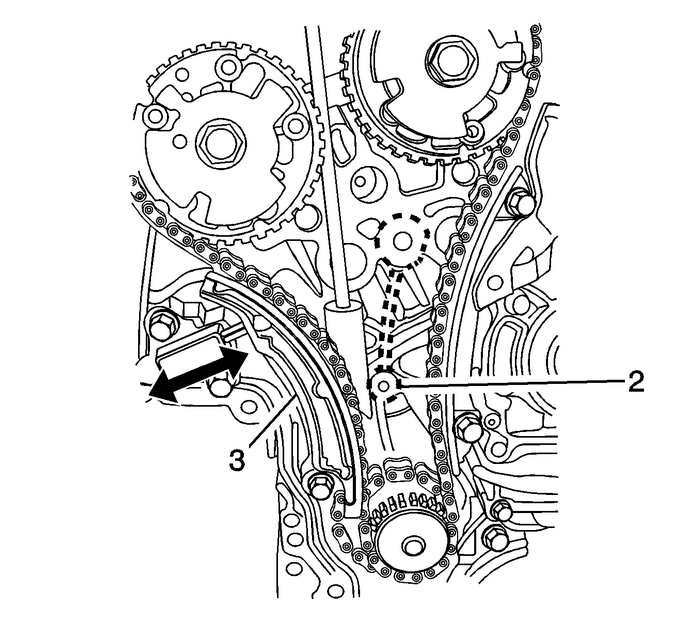 EN49982-2 retainer-(1) will be installed in the following steps such that it wedges between an internalrib-(2) that is cast into the inside of the front cover (shown in dotted line above)and the timing chain and spring-loaded tensioner shoe-(3), holding the chain in position.The wedge will be left in place during the cam position actuator and/orcamshaft service. Insert the EN49982-2 retainer between the two camshaft position actuators with the “teeth” on the EN49982-2 retainer facing toward the front cover. 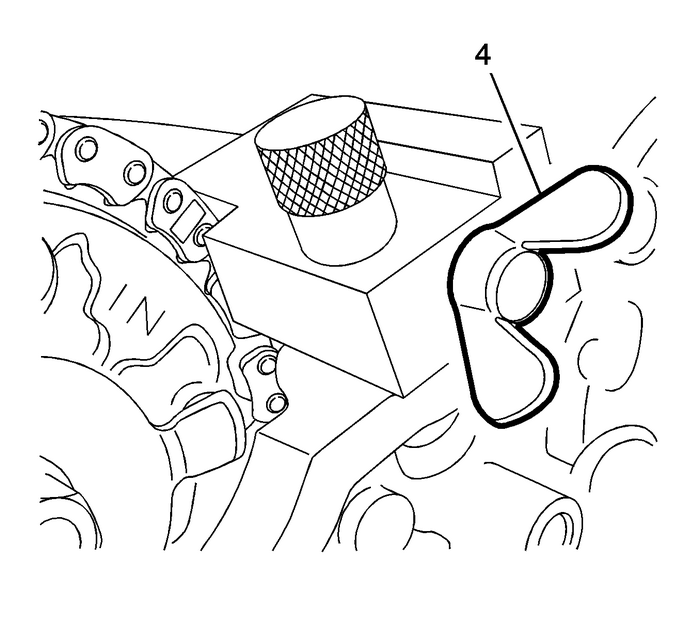 Once the wedge portion of EN49982-2 retainer is below the camshaft position actuators, rotate the EN49982-2 retainer until the flat in the handle faces toward the intake camshaft position actuator.This orients the “teeth” toward the chain. Note:Do not try to force the wedge into position, simply ensure it is loosely engaged inthe timing chain and in the correct overall position. 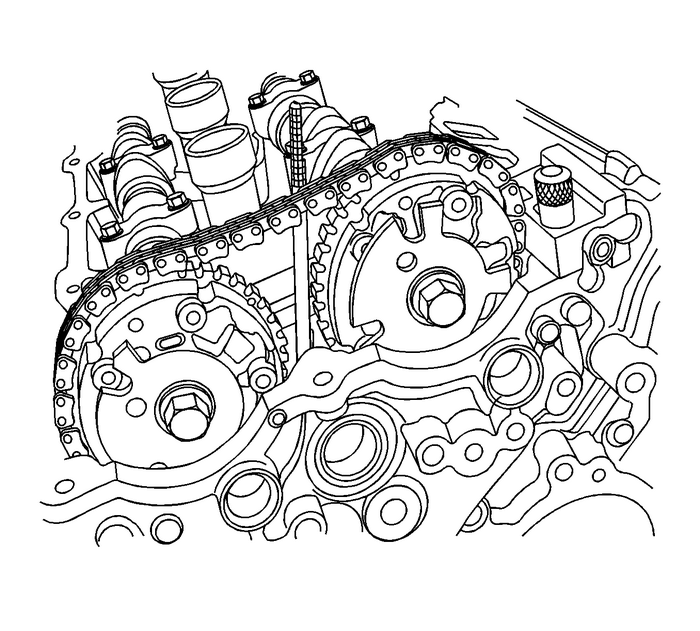 Drop the wedge down until it begins to engage the timing chain and the belt casting-(2). 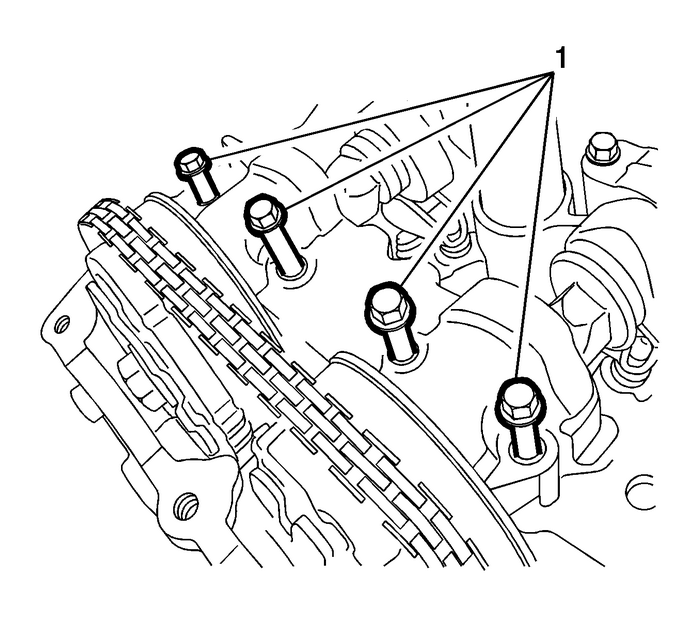 If possible shine a strong light down from above, between the camshaft position actuators,and see the wedge in overall position as shown in the above graphic. Using a 20-mm wrench on the cast hexagonal portion of the exhaust camshaft, rotatethe camshaft toward the intake camshaft while pushing down on the handle of the EN49982-2 -retainer. 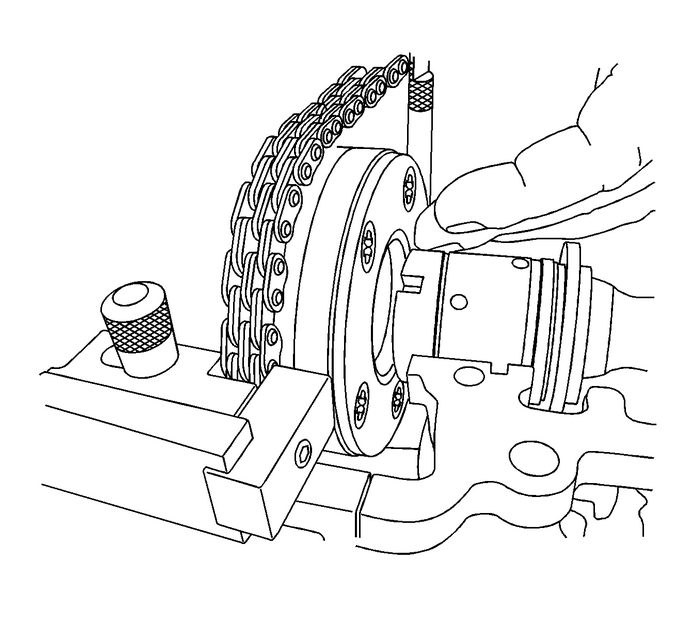 This rotation of the camshaft will compress the tensioner shoe-(3) against the springforce of the tensioner, opening up a gap between the chain and the internal rib inthe front cover. The wedge will then drop into this gap. You will feel a distinctclick as the teeth engage the chain. Caution:Be sure the EN49982-2 is captured firmly as described beforecontinuing. This is critical to ensuring the camshaft drive chainsstay properly timed. Release the force on the wrench, allowing the spring tension to close the tensionershoe against the wedge portion of EN49982-2 -retainer. You should be able to lightly tug on the EN49982-2 retainer and it should stay in position. Repeat Steps 20 and 21 if necessary to re-inserttheEN49982-2 retainer until you are certain it is in position and will stay in position. 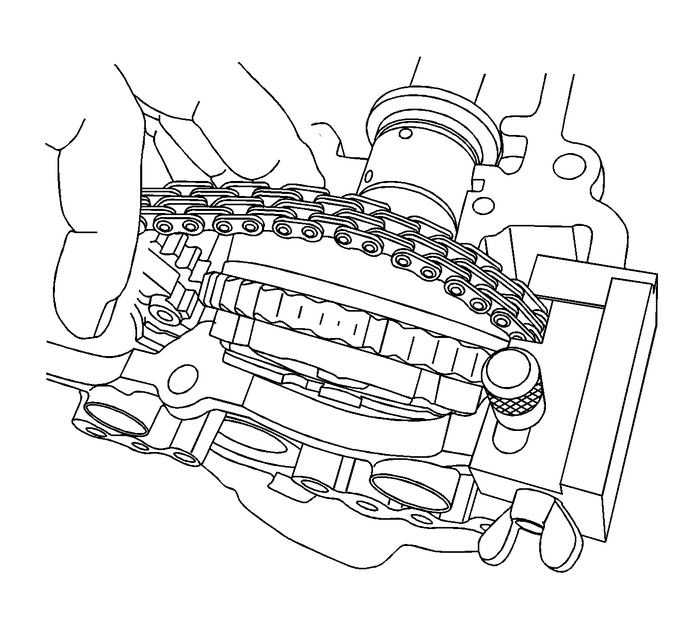 With EN49982-2 -retainer in position and with the 20-mm wrench removed, there should now be some slack inthe timing drive chain as indicated in the graphics shown. Do not pry against the face of the camshaft position actuators or the position actuatorretaining bolt. 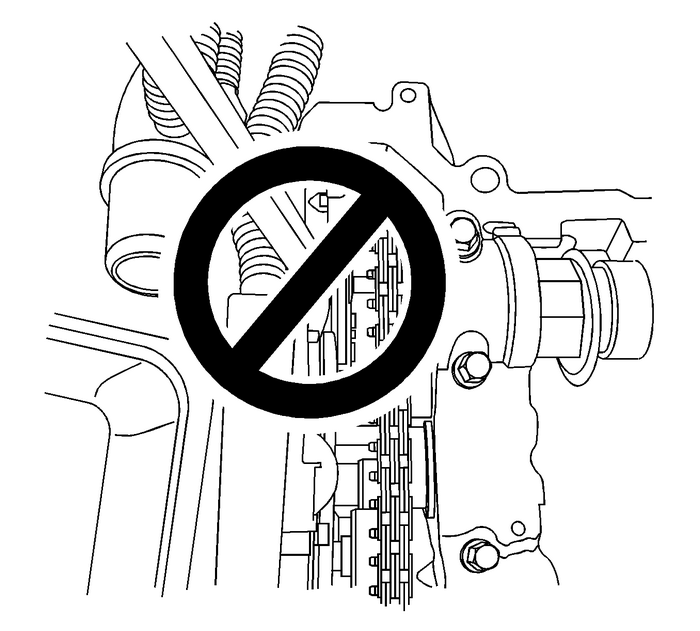 Caution:Do not pry against the face of the camshaft positionactuators or the position actuator retaining bolts as the positionactuators will be damaged. Position a screwdriver or small pry bar between a camshaft cap and camshaft lobe.Carefully move/pry the camshafts as far as possible toward the rear/flywheel end ofthe engine. 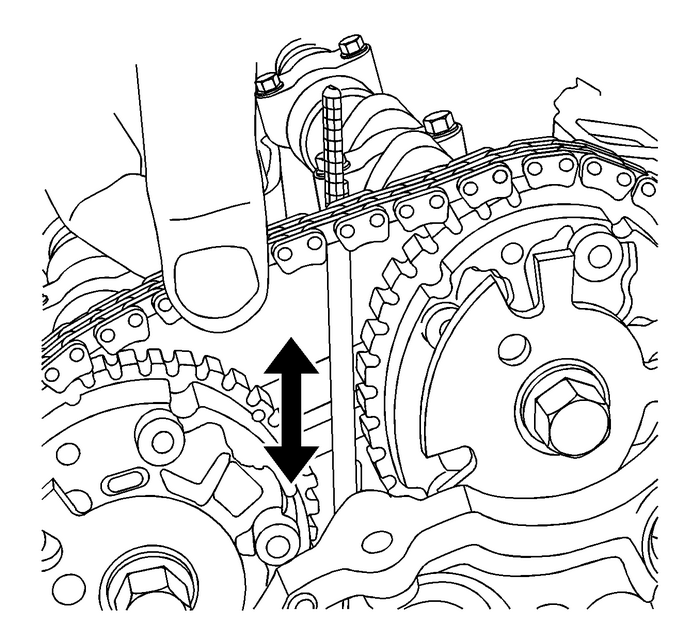 Note:Do not move or disturb the EN49982 retainer components after their installation or the timing chains may be lost inside the frontcover. The EN49982-1 -retainer and EN49982-2 -retainer should be in position as shown, they must be left in position during the servicingof the camshaft position actuator(s) and/or camshaft(s). To remove the intake camshaft position actuator, remove the loosened retaining bolt.To remove only the exhaust camshaft position actuator, skip the steps for removingthe intake camshaft position actuator. 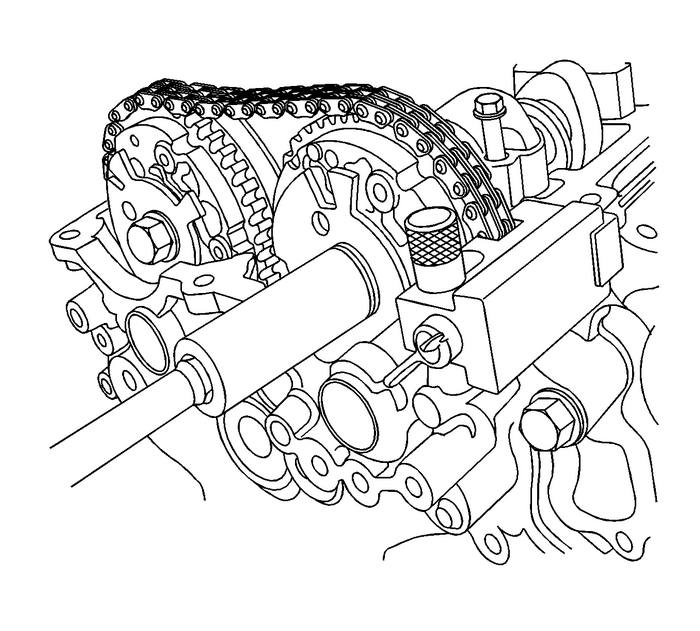 However, the EN49982-1 -retainer MUST be installed as discussed even if the intake side will not be serviced or thetiming of the camshaft chains will be lost. Slide the camshaft position actuator forward and off the end of the intake camshaft.The slot in the EN49982-1 -retainer will allow the tool to move forward enough to disengage the camshaft position actuatorfrom the front of the camshaft. 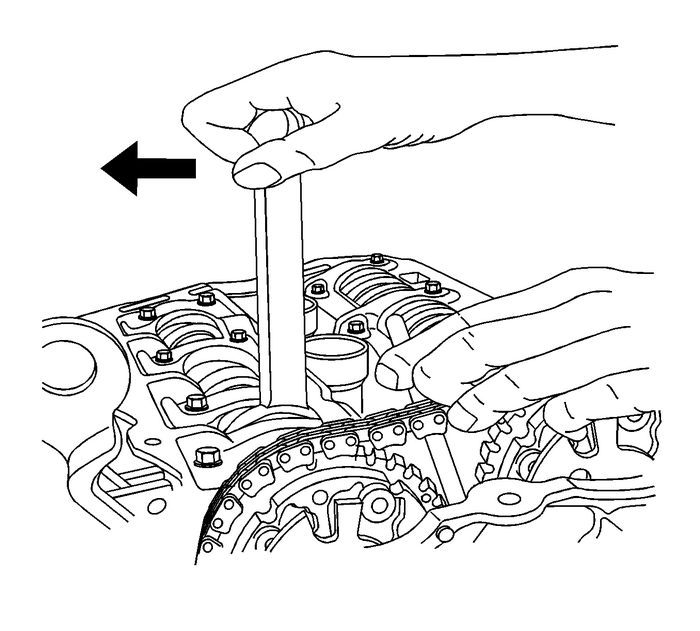 Remove the plastic thrust washer when removing thecamshaft position actuator fromthe end of the camshaft. Tilt the camshaft position actuator forward and out/away from the engine. Note:DO NOT remove the EN49982 -retainers. They are holding the cam chains to maintain their properly-timed positions. It may help to carefully pry the camshaft forward and to move the EN49982-1 -retainer backward via the slot to reengage the position actuator to the camshaft. 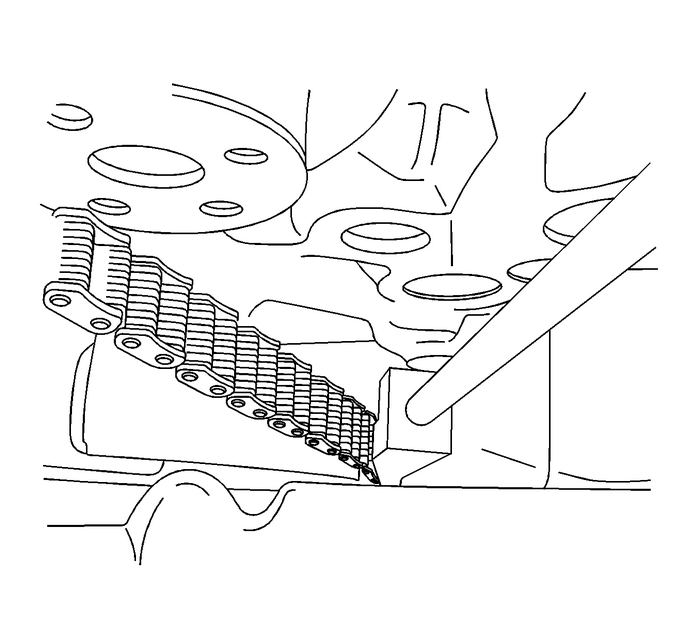 The dowelpin on the camshaft position actuator must be aligned with the slot in the camshaftnose for reassembly. 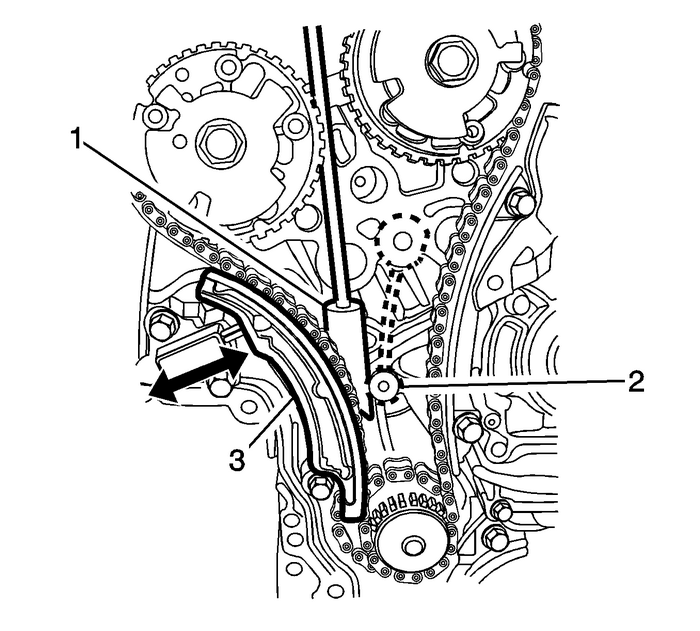 Install the intake camshaft position actuator first by inserting the actuator betweenthe timing chain and front cover. Tilt the actuator in and engage the chain whilealigning the marks you made on the chain and position actuator. Ensure the camshaft position actuator fits snugly to the end of the camshaft. Install the intake camshaft position actuator retaining bolt, and lightly tightenthe bolt to hold the camshaft actuator in place. DO NOT torque at this time.Install the exhaust camshaft position actuator retaining bolt, and lightly tightenthe bolt to hold the camshaft actuator in place. DO NOT torque at this time.Double-check that the marks on both the intake and exhaust camshaft position actuatorsto ensure that they are aligned with their respective paint marks on the chain. 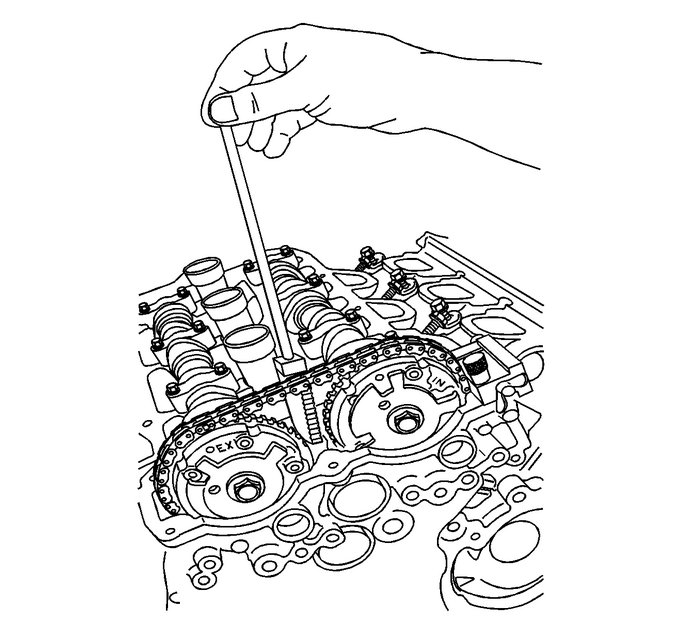 Using a 20-mm wrench on the cast hexagonal portion of the exhaust camshaft, rotatethe camshaft clockwise while pulling up on the handle of the EN49982-2 -retainer.Remove EN49982-2 retainer.Release the pressure on the wrench. 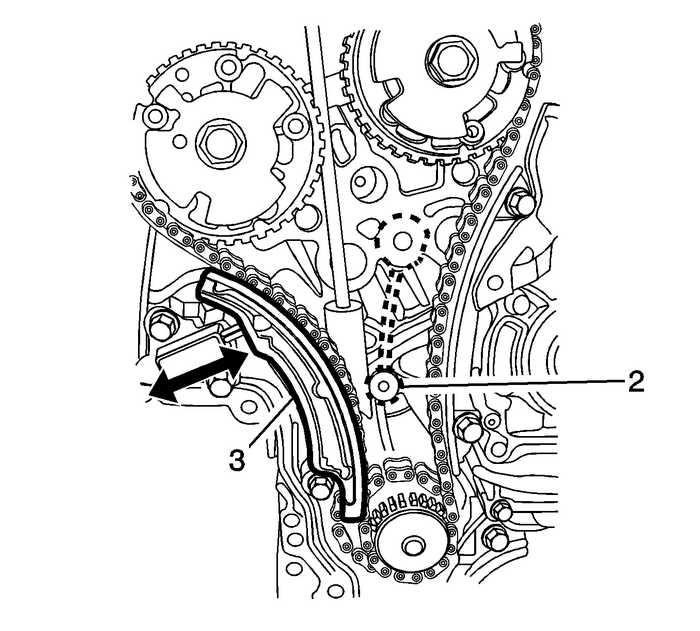 The timing chain should now be tight and shouldlose the slack the wedge was providing. Note:-Double-check the marks on the camshaft position actuators and chains to ensure theyare correct. Torque one or both camshaft position actuator retaining bolts to 58-Y (43-lb-ft). 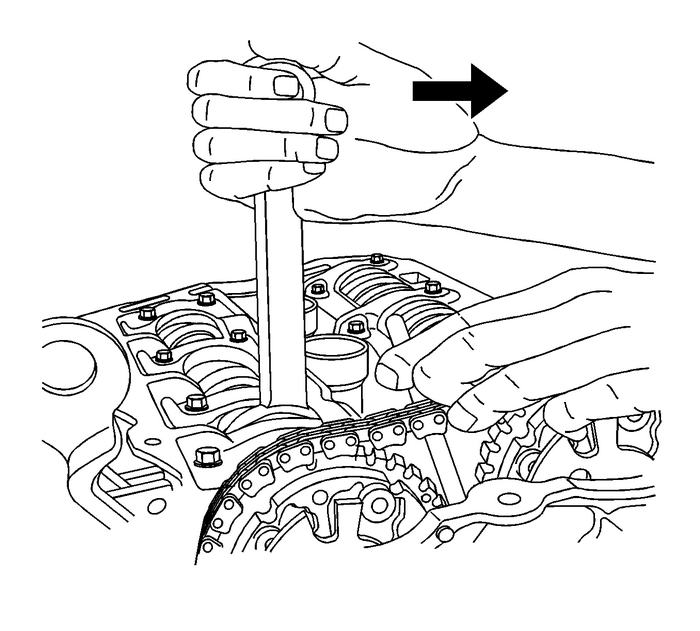 Unscrew the wingnut on EN49982-1 -retainer to release timing chain, and then remove EN49982-1 -retainer from the front cover by unscrewing the thumbscrew-(2). Install camshaft front cap and bolts-(1).Tighten the camshaft front cap outer bolts to 10-Y (89-lb-in).Tighten the camshaft front cap inner bolts to 10-Y (89-lb-in).Install the camshaft position actuator solenoid valve solenoid – exhaust. Refer toCamshaft Position Actuator Solenoid Valve Solenoid Replacement - Bank 1 (Right Side)Exhaust.Install the camshaft position actuator solenoid valve solenoid-intake. Refer toCamshaft Position Actuator Solenoid Valve Solenoid Replacement - Bank 1 (Right Side)Intake.Install the intake camshaft position sensors. Refer toCamshaft Position Sensor Replacement - Bank 1 (Right Side) Intake.Install the exhaust camshaft position sensor. Refer toCamshaft Position Sensor Replacement - Bank 1 (Right Side) Exhaust.Install the camshaft cover. Refer toCamshaft Cover Replacement - Right Side.